Give me your outlandish, eccentric, and bizarre. When I travel, that is what I want. The Schönbrunn Gardens in Vienna are beautiful, yes, but so are the Longwood Gardens — just over 50 kilometers away from my home in Philly. Instead, give me Bomarzo and its Parco dei Mostri (Park of Monsters!). Wine? Same. I’ve drunk and enjoyed many Merlot, Tempranillo, Grenache Blanc, Pinot Noir, etc. I have not, however, sampled Switzerland’s Hitzkircher. But, the next time I’m in Zurich I’ll drive the 40 km to Hitzkirch and try some! And, on my way from Zurich, I’ll stop at the Weinrebenpark. Why? Because the fantastic, fanciful, and phantasmagoric thrill me. Also, Weinreben! Melding the unusual with “grape vine” is a decided plus. So, with major props to Atlas Obscura, I here offer a Travelogue of the Peculiar — grapes and places edition. Yes, we’ve landed in Zagreb and are now in Croatia, in Moslavina. Moslavina is a district in the central part of Croatia, partially bordering Bosnia and Herzegovina. It is home to at least two singularities: the Škrlet grape, and a monument that seemingly pays homage to the Millennium Falcon. Škrlet is a white grape with extremely limited production; it was near extinction a half-century ago, and as of 2010 covered only 61 hectares (Anderson 2013). All of those hectares are in Moslavina. The grape has characteristic red “freckles”, or spotting, that resembles Scarlet Fever, from whence the name derives (German scharlach). Moslavina Škrlet Kosovec 2015is one result of his embrace of harmony between nature and wine production. The wine has characteristics of sour beer and hard apple-cider, particularly on the nose. Once the funk mellows a bit, flavors of green apple and pear come through. The wine has an acid astringency that demands food. This would be an excellent aperitif wine, and definitely one to try if you typically enjoy fino or manzanilla sherry while eating olives and almonds. Now that you have a glass of wine in you, let’s tour Moslavina. But what’s this? How did the Millennium Falcon come to land on an artificial lake in Podgarić, Croatia? It begins with Marshal Josip Broz Tito, architect and leader of the socialist Yugoslav Republic from its inception in 1943 until his death in 1980. Tito gained acclaim as commander of the Partisans (aka, The National Liberation Army and Partisan Detachments of Yugoslavia), perhaps the most successful resistance group of World War II. It formed in 1941, after the invasion and occupation by the Axis powers resulted in the carving up of the former Yugoslav Kingdom; much of modern Croatia — as the Independent State of Croatia — was under the de facto rule of Germany. Building on early military successes against the Axis occupiers, the Partisans grew as a multi-ethnic resistance force of Croats, Serbs, Slovenes, Montenegrins, Macedonians, and Bosnians — the very composition of the later Socialist Federal Republic of Yugoslavia. The size and strength of this broad coalition established the communist-led Partisans as the leaders of the emerging country, and Partisan-leader Tito became Prime Minister of the Yugoslav Republic in 1944 — one year before the Germans were finally pushed out. Tito was named the county’s President in 1953. His rule, as well as the Yugoslav Republic, were largely bound to the WWII activities of the Partisans. As a result, Tito afforded much effort to memorialize their role, commissioning a number of monuments in honor of them and their battles. One such monument is in Podgarić, near to Kutina. The Monument to the Revolution of the People of Moslavina dates to the late-1960’s, and is the work of the now-deceased sculptor, Dušan Džamonja. As the monument pre-dates the Star Wars movies from whence the Millennium Falcon was born, perhaps the winged-cockpit sculpture provided inspiration for Han Solo’s ship? Regardless, many more of Džamonja’s works are on display in Coastal Croatia in his Sculpture Park near Vrsar. But that is a different trip and a different grape, perhaps Žlahtina? Where are we now? Northwestern Spain, that’s where! The Doña Blanca grape takes us to Bierzo and onward to the Parque del Pasatiempo. Doña Blanca may well be a real person, but the reference is to a grape. This white grape is indigenous to the northwest coast of the Iberian peninsula. In Spain, it is grown in Galicia and in Bierzo, which in the contiguous Castilla y León region. The grape has a very thick skin, which enables it to thrive in those regions’ wet and humid conditions. Bierzo is one of only 3 DO’s (in the Spanish appellation system, Denominación de Origen)in which Doña Blanca is allowed. Bierzo is also home to the Godello grape, and it is in combination with that well-structured and full-fruited grape that the aromatic, bitter, and less-acidic Doña Blanca reaches its fullest potential. The historic Vinos Guerra estate is found just outside Ponferrada, the largest town in Bierzo. They are the oldest estate in Bierzo, dating from 1879. Their vines, too, are old; among both the Mencia and Doña Blanca are vines greater than 50 years old. These vines are carefully tended, following organic and sustainable practices. The Bierzo Blanco Armas de Guerra 2015 is made with old-vine Doña Blanca (85%) combined with Godello (15%). This duo produces a wine with a nose perfumed with citrus, ginger, and jasmine. It has a lighter body, but with full, juicy apples and pears. The finish lingers nicely with mineral traces and bits of citrus and ginger. Leaving the Armas de Guerra estate, we are heading to Galicia! Doña Blanca is also grown here, and a pit stop for Pulpo a la Gallega is definitely warranted, but we are venturing to the Parque del Pasatiempo in Betanzos. Betanzos was the birthplace of Juan María and Jesús García Naveira. After making substantial money abroad (in Argentina), the brothers returned home to philanthropic endeavors in Betanzos. In addition to aiding educational, hygienic, and nutritional needs for locals, they used their wealth to help their townsmen see the world…from home. Knowing that their experiences were unique and unlikely to be experienced by their neighbors, they set about making a parque enciclopédico to document some of places they had seen, and perhaps some about which they had only heard (sea monsters?). In essence, they created a “book in stone”. Colorful, sculpted animals and people can be found in relief on the park’s walls, which is also dotted with fountains and classical architecture. Among the “real” people and places are featured Carrara-marble lions modeled after those from the tomb of Pope Clemente XIII (whose tomb is in the Vatican), a map of the then-proposed Panama Canal, and architectural works from Egypt. Fantastical monsters with jaws agape clearly reference Bomarzo (mentioned above), but it isn’t immediately clear in what sea the diver/astronaut (=argonaut?) was encountered. Viva Italia! Tuscany holds a central, geographical position in Italy, stretching along the Tyrrhennian Sea from the Carrara-marble quarries in Massa and Carrara to just past the ancient Roman city of Cosa, situated in the modern town of Ansedonia. In other words, it encompasses Florence, Sienna, and Grosseto, but not Genoa or Rome. It also “enjoys” a reputation for rustic simplicity that does not do justice to its vibrancy and complexity (I’m blaming you, Frances Mayes, for romanticizing with a sun-washed vapidity). Tuscany is also home to the Sangiovese grape and many well-known regions and appellations whose wines revolve around it: Chianti, Montalcino, Scansano, etc. But, Tuscany is not just Sangiovese. Vermentino, Vernacchia, and Ansonica are among the white grapes grown, and Syrah, Alicante Canaiolo, and Vermentino Nero are among the red. Vermentino Nero is, as the name suggests, thought to be a color mutation of the (white) Vermentino grape, though that has not been demonstrated. Really, not much is known about this grape whose growing region is fairly restricted to its indigenous home of Lunigiana, which is in Massa Carrara at the northern tip of Tuscany. Lunigiana is also in the southern tip of Liguria, however, as its border follows an ancient district of Roman origin. Even within the small area of Lunigiana, the different micro-regions result in Vermentino Nero being grown almost solely in Tuscany and not in Liguria. Liguria is mostly coastal — it comprises the Italian Riviera — from La Spezia in the East to France and Nice in the West. Its main city is Genoa, though the picturesque villages of the Cinque Terre, west of La Spezia, remain one of its biggest tourist draws. This part of Liguria is not within the borders of modern Lunigiana, which do not reach the coast; the Cinque Terre lies well within its ancient borders, which included most of the region of La Spezia. Occupying several parts of that ancient Lunigiana is the Terenzuola winery. The winery, itself, is located in the Cinque Terre town of Riomaggiore. Some of their grapes — Bosco, Albarola, and Vermentino (bianco) — are also grown in the Cinque Terre landscape. Others, are grown in the Tuscan portion of Lunigiana; Vermentino Nero is grown in the heart of Lunigiana, in Fosdinovo. Vermentino Nero Terenzuola Toscana IGT is made from 85% Vermentino Nero, plus “allowed” grapes such as Canaiolo. The grapes are hand-harvested, fermentation occurs in open barrels, and the wine is aged six months in cement. This rare wine is delicious. The ripe raspberries and cherries share a palate with wild, crushed herbs and some white pepper. The wine is juicy and lighter bodied. Since we’ve partly ventured into Liguria, let’s visit one of its peculiarities. How does a giant bunny made out of pink wool strike you? Follow the coast past Genoa, then north toward the mountains (the Ligurian Alps) where the road leads to the town of Artesina. There, you’ll find a 200 foot long and 20 foot high stuffed rabbit — in pink wool. It is an “art” project from “Gelitin”, a group of four artists from Vienna. Why? Why not. They plan to leave the bunny in place for 20 years (until 2025), if the elements don’t intercede. Oh, did I mention it is visible from space? Welcome to France! Since we already spent time on the Italian Riviera, we’ll skip past the French Riviera and head north towards Gaillac. Gaillac is just northeast of Toulouse, and both are well within the country’s southwest region. Here, one can find the grape Braucol and visit Le Petit Paris, a mini-Paris. The wine region of southwest France borders the Atlantic Ocean to the west, Spain to the south, Languedoc-Roussillon to the east, and Bordeaux to the north. is known for its Mediterranean climate and powerful, Mistral winds. It is also home to the wines of Gaillac. Gaillac’s climate has Mediterranean influences from the East, as well as cooler maritime temperatures from the Atlantic Ocean to the West. Grapes can ripen well from the hot days, keep fresh with the cool nights, and stay healthy with the cleansing and drying effects of the winds. The red grapes that grow here are dark, robust, and rustic — including Syrah, Duras, and Braucol. Braucol is indigenous to South West France and is particularly prevalent in nearby Marcillac, where it is called Fer Servadou. Interestingly, the “Fer” in the name is for the iron-like strength of the vine, rather than the iron-rich soils of Marciallac, or an iron taste-component. But, one of the features I find most compelling about the grape — whether Fer or Braucol — is the iron taste it imparts. Domaine Plageoles is found in Gaillac. They are one of the areas oldest producers, but do not carry the Gaillac AOC on their lables. Their wines are made from 100% of a given, indigenous varietal, which disqualifies them from the appellation name (a blend is required). Braucol, Domaine Plageoles, is made with 100% Braucol. Farming is organic, and wine-making prizes low intervention. The yeast is indigenous, and the filtering is light. Though the Domaine’s soils are clay and limestone, there is a decided iron note in this wine. It joins brambles, juicy prunes, cassis and under-ripe black plums. Great mouth feel, long finish. What to do when the finish finally ends? Head to Vaïssac! This small town just 35 kilometers from the Domaine is the home of Le Petit Paris. What is Le Petit Paris? One man’s labor of love — and conservation! Gerard Brion spent years creating miniature replicas of famous sites in Paris. The Eiffel Tower, the Louvre, the Seine and its bridges — even boats in the water and cars on the bridges — are all there. One can even take in a show at the Moulin Rouge — with mini can-can dancers! Why conservation? He used trash. He used gobs of trash. The replicas are made of discarded cans, bottles, and cardboard. So, go green in Gaillac! Ladies and Gentlemen we have landed in Portugal. The Beiras region lies north of the capital, Lisbon. Beiras is home to the Baga grape and Portugal dos Pequenitos, a park devoted to Portugal and its exploits. Baga is a red grape that is indigenous to Beiras. It is known as a “difficult” grape to grow, and can fare poorly in too-cool climates — where it needs a lot of sun to thrive. The Beiras region spans the width of the country, but has coastal (Beira Atlantica) and interior (Beira Interior) divisions. In the coastal portion is Barraida — the most famous area for Baga and also a Portuguese DOC (Denominação de Origem Controlada). Baga does well in Barraida because of the warming influence of the Atlantic Ocean. The interior has no DOC; its wines are classified as VR (Vinho Regional) — similar to a French vin de pays. However, one of the region’s most notable estates is found in Beiras, and produces Baga. Quinta de Foz de Arouce is located in Lousã, near the city of Coimbra. The incredibly old Qunito de Foz de Arouce estate dates to the 16th century, and it is still in the hands of its hereditary family, the Osório, whose head is the Conde (Count)de Foz de Arouce. Baga does well here due to its “protected” location in a bowl between mountains, and due to the schist soils that have plenty of alluvial gravels to collect the sun and moderate the nights’ cold temperatures and the morning fog. Foz de Arouce is, literally, in a class by itself in the Beiras; there is not another vineyard within a 50-miles radius. Tinto Quinta Foz de Arouce, Beiras is made with 85% Baga and 15% Touriga Nacional, both of which are a little dark and a little wild. The grapes are sustainably grown and hand-harvested, and the wine is aged 8 months in oak. Flavors of earth, coffee, leather, cocoa, deep plum, and licorice are abundant. The wine is smooth and bold. After such delicious wine, we can head back to Coimbra for some sightseeing. Where to go? Portugal dos Pequenitos, also known as Portugal’s oldest theme park. The park is somewhat a mix between Le Petit Paris — as the amusements are in miniature, and Spain’s Parque del Pasatiempo — as the park is a ‘‘living portrait of the Portuguese way and of Portuguese presence in the world…’’. The Parque dates to 1940 and World War II, a war in which Portugal retained neutrality under its authoritarian leader, Salazar. 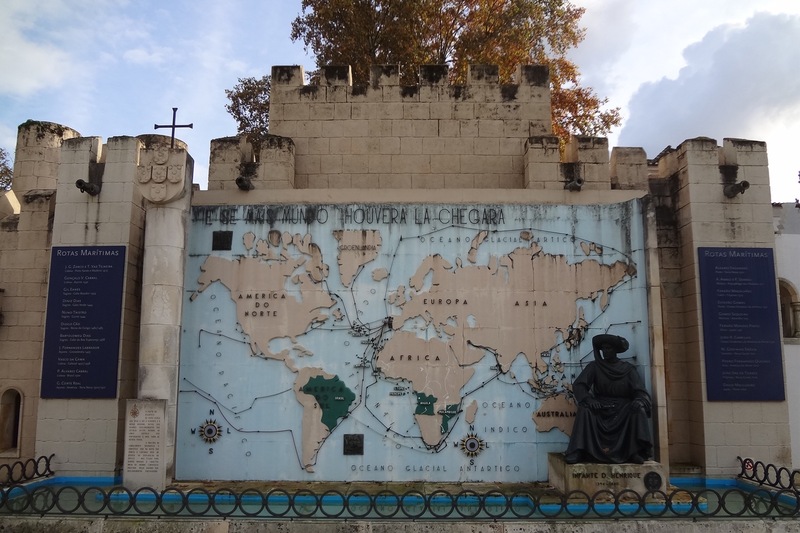 Despite the then-current political milieu, the Parque showcases mostly pleasantries of the Portuguese experience, like monuments and monumental architecture, and is primarily geared toward children. Of course, in relating its history — particularly in exploration and maritime commerce — the Parque also makes reference to its colonial past, with depictions and statues of Portuguese-speaking locales in Africa and Asia. But, it isn’t just Portuguese history, as the American pop-culture icon, Barbie, is the focus of an on-site museum. So, this is my armchair travelogue of the peculiar, part 1. These are grapes (and wines and sites!) that are just off the beaten path, but are definitely worth seeking out.